My secret confession….time has completely gotten away from me. Okay, that is probably not a secret, and I am sure that I am not alone. However in the drought stricken California it has brought fall on a little earlier then expected; I am already harvesting peaches from my little trees, my neighbors are already harvesting grapes to begin the “crush” and create wine, none of this usually ever happens before September, so I am probably thinking it is later in the year then it is. I am pulling out the dehydrator and beginning to get my canning supplies together to put up fruit from this early season. My little farm is awaiting new arrivals as I have a broody chicken, a hen that is sitting on eggs, and I should soon be seeing new little chicks. 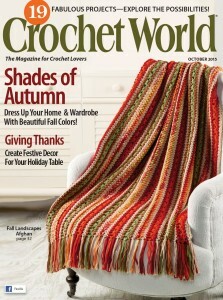 However, even with all this rural lifestyle events I have some fun things happening in crochet. Since autumn us so prevalent on my mind lately I am happy to share the release one of my latest designs in Crochet World Magazine. The October 2015 issue features my Autumn Leaves Place Mat. 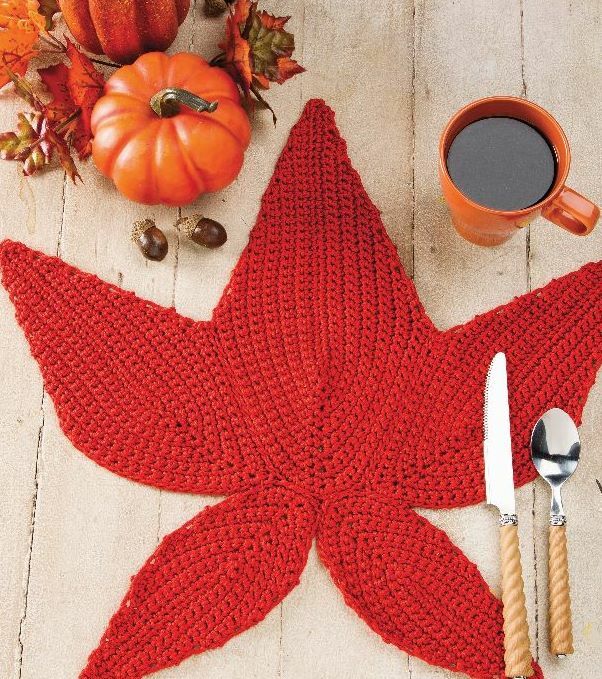 This place mat is created in utilizing 5 join as you go motifs, which are shaped to resemble leaves, created in Cotton Classic Lite from Tahki Yarns. I find that I use place mats in my home more then I would have thought; this is mostly due to the fact that I actually picked out and purchased my dining room table, but the wood is a little softer than I realized and is can scratch and mar without much effort. So this place mat is just big enough to fit a plate and silverware while adding a fun and festive feel to my meal table. Even though the design is worked in fall colors, I think a nice gold or orange would be nice, even a striking brown, but I could also reinvent this design for spring and work some up in beautiful shade of green. I hope that winter does not delve in to quickly (although I wouldn’t mind some rain), so that I can savor a little of this time of change.